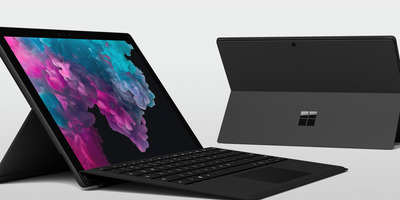 MicrosoftThe Microsoft Surface Pro 6 is the latest version of Microsoft’s tablet/laptop hybrid — and it now comes in a sleek, matte black finish. The Surface Pro 6 is the latest version of Microsoft’s flagship tablet/laptop hybrid. The biggest changes are under the hood: Microsoft says it’s 1.5 times faster than the last model, which was released in early 2017. It also comes in a sleek, matte black finish. The Surface Pro 6 is available to preorder today for its release on October 16th, and starts at $US899. Microsoft’s trend-setting tablet/laptop hybrid just got an upgrade: Meet the all-new Surface Pro 6, announced on stage at a Microsoft event on Tuesday in New York City. It’s available for preorder today, and will be available to buy on October 16th. The design hasn’t changed much from the Surface Pro that’s currently on store shelves, released in early 2017. It’s still a Windows 10-powered tablet with a 12.3-inch display. It’s priced starting at $US899, with an optional-but-not-really $US129 keyboard accessory available for purchase that can turn it into a lightweight, touchscreen laptop. The changes are all under the hood, Microsoft says. The headlining upgrade in the Surface Pro 6 is a new quad core processor that Microsoft claims makes it 1.5 times faster than the previous model. That extra power doesn’t seem to come at the expense of battery, as Microsoft says that it still gets 13.5 hours of life, at least when it’s doing nothing but playing videos in the browser. In terms of aesthetics, the Surface Pro 6 does bring one new thing to the table. For the first time in a long time, Microsoft is making the Surface Pro 6 available in a sleek, black finish. If that doesn’t do anything for you, it’s also available in platinum. Otherwise, the Surface Pro 6 is much the same as previous iterations. It has one USB port, a micro-SD card slot, a headphone jack, and a port for Microsoft’s proprietary Surface Connect charging cables. A notable absence is a jack for USB-C, the rising standard that Apple has embraced full-throatedly with its newest MacBooks, and which Microsoft itself included with the super-small Surface Go laptop it released earlier this year. Generally speaking, it’s not necessarily a bad thing that the Surface Pro 6 isn’t radically different. After all, why mess with success? In my own experiences with the Surface Pro, I’ve found it to be the right balance between portability and productivity – because it runs a full version of Windows 10, it has a wider range of software than an iPad, including “real” versions of Microsoft Office; because it’s a touchscreen tablet, it’s lighter and more flexible than an iPad. Still, if this doesn’t do it for you, Microsoft also announced on Tuesday the $US999 Surface Laptop 2 – a regular (but very good-looking) touchscreen laptop – as well as the $US3,499 super-high-end Surface Studio 2, an all-in-one PC that competes with the iMac.